Next Friday the online auction will start. 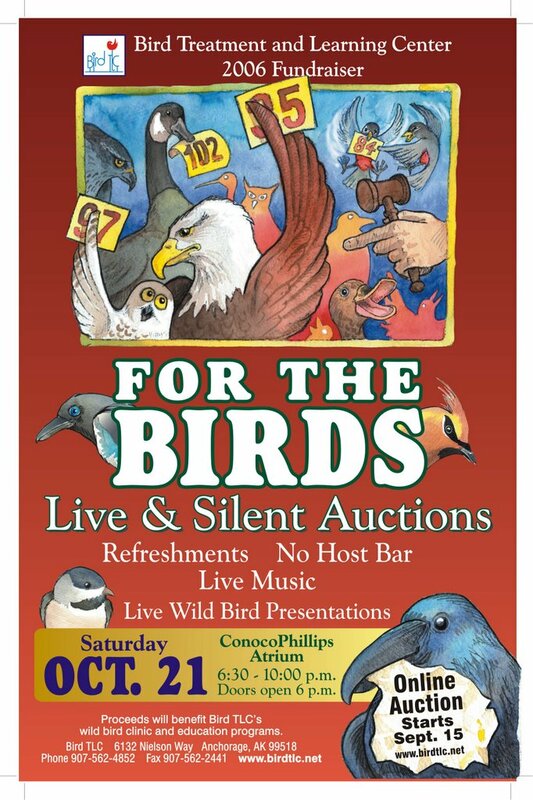 The live and silent auction will be on Oct 21st at the ConocoPhillip's Atrium in Anchorage. Stweart Allison, one of our clinic volunteers on Tuesday's, design the poster. What do you think??? Also, Bye-Bye Birdie will be on Spet 23rd at the Bird TLC property overlooking Potter Marsh. 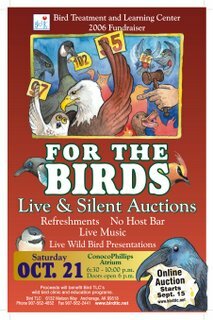 For more info, go to www.birdtlc.net . That will be the place to say goodbye to all of the migratory birds until next year. Also, Joan Harris will be signing her book "One Wing's Gift" at Tidal Wave books on Thursday Sept 21st at 7:30PM. Mary bethe will be presenting a golden eagle at the same time.